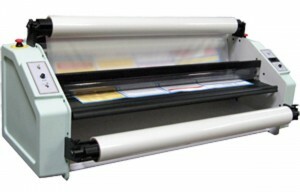 Laminating is a process which provides a film layer to prints. This provides rigidity, stability, protects from abrasion, enhances color and protects the print from moisture. Laminates are available in 3 Mil Gloss, Satin and Matte, and 5 Mil Gloss and satin. We can furnish the laminated print with a bleed trim if it is to be used indoors, or leave ¼” laminate around the print edge to encapsulate the print to promote protection from moisture or weather.